It seems that Spice mobiles is ready to introduce budget Quad core Android device in India (Spice Mi 535 Stellar Pinnacle Pro ) . Spice Mi 535 Stellar Pinnacle Pro runs on Android 4.2 jelly bean . Spice Mi 535 Stellar Pinnacle Pro does have Dual Sim capability (GSM + GSM ). Spice Mi 535 Stellar Pinnacle Pro draws its strength from 1.2GHZ Quad core Processor integrated with 1GB RAM . Spice Pinnacle Pro seems to a nice competitor for budget quad core android devices like Micromax A116 canvas Hd , Umi x2 , Gionee Dream D1 , Gionee G2 Gpad . Spice Mi 535 Stellar Pinnacle Pro has 5.3inch capacitive touch screen having resolution of 960 x 540 QHD . Display resolution would cause disappointment for some peoples . Spice Mi 535 Stellar Pinnacle Pro Price is Rs 14,990 & it is available for pre-booking ( pre order ) online . 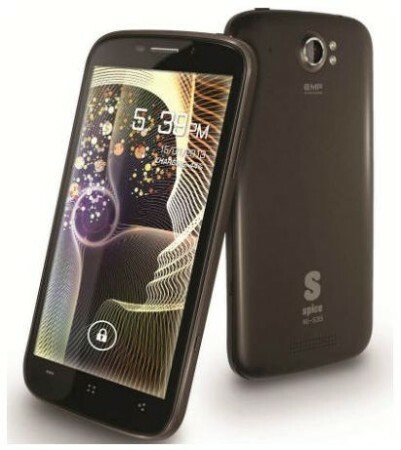 Spice Mi 535 Stellar Pinnacle Pro is upcoming Quad core android device from Spice Mobiles . Spice Mi 535 Stellar Pinnacle Pro runs Android 4.2 jelly bean Os . The device is powered by 1.2GHZ Quad Core Processor . Spice Mi 535 Stellar Pinnacle Pro has 1GB RAM & 16GB ROM ( internal memory ) . Further memory can be expandable by inserting micro sd card upto 32GB . Spice Stellar Pinnacle Pro runs gets 8MP autofocus rear camera with Led Flash and 5MP wide angle front facing camera . As the front camera is of 5MP resolution and has wide angle lens it will be great for capturing images as well as videos . With Spice Mi 535 Stellar Pinnacle Pro the user can easily record 1080p Full HD videos . The device can play 1080p videos . Spice Mi 535 Stellar Pinnacle Pro has 3G , wifi , Bluetooth , aGPS , 3.5mm audio jack , Micro Usb & USB OTG connectivity . The Mi 535 Stellar Pinnacle Pro has Magnetic sensor , Gyro sensor , light sensor , proximity sensor & G- sensor . The device is powered by huge 2550mAH battery . The device is Priced at Rs 14,990 . The device comes with dual sim capability . 1GB RAM & 16GB RAM ( internal memory ) . 8MP REAR AND 5MP wide angle camera (both auto focus ) . 3G , wifi , Bluetooth , aGPS , 3.5mm audio jack , Micro Usb & USB OTG . Magnetic sensor , Gyro sensor , light sensor , proximity sensor & G- sensor . Spice Mi 535 Stellar Pinnacle Pro vs Other Quad core Android devices ( Under Rs 20,000 ) . Micromax A116 canvas Hd – Micromax A116 canvas HD has 5inch 720p resolution display . Samsung Galaxy Grand ( review ) – Samsung Galaxy Grand has Dual Core processor & 5 inch wvga screen . Gionee G2 Gpad – Gionee G2 Gpad is another Quad core device having 5.3inch display . Samsung Galaxy Win – Samsung Galaxy win is upcoming 4core device from Samsung . Xolo Q800 – Xolo Q800 has 4.5 inch QHd display . Zen Ultrafone 701 hd – Zen Ultraphone 701hd has 5inch 720p display & it comes at very attractive price . Alcatel One Touch Scribe HD – It is another 4core device from a well known and trusted brand . Jiayu g4 – Jiayu G4 has 1GB / 2GB ram & 4.7inch screen .